CHILLICOTHE, Ohio (June 22, 2016) - Kyle Larson earned his second Ohio Sprint Speedweek presented by Cometic Gasket victory of 2016 during round six on Wednesday evening, June 22, at Atomic Speedway. Larson used traffic to his advantage to garner the win, taking command over race leader Sheldon Haudenschild on lap 21. From there, the Elk Grove, California, native cruised ahead and led the last ten circuits to score the $5,000 top prize. It was a fourth career Arctic Cat All Star Circuit of Champions victory for the NASCAR Sprint Cup Series star, his first at Atomic Speedway. 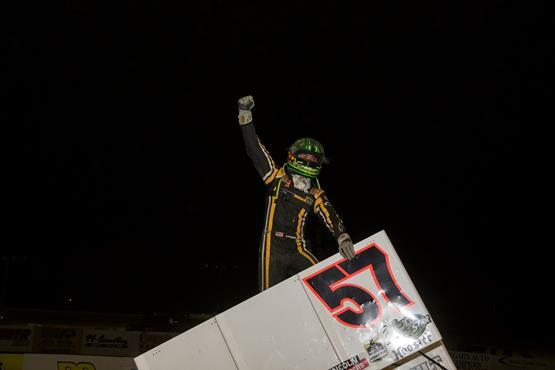 Larson is the first repeat winner of the 34th edition of Ohio Sprint Speedweek presented by Cometic Gasket. Kyle Larson started third on the feature grid, maintaining third in the running order at the completion of lap one. After surviving a four lap battle with Tim Shaffer for the third spot, Larson moved on and started his chase toward the front. By lap 14, Larson worked around Cole Duncan for second, utilizing the high side of turns one and turn and the low side of turns three and four. Heavy traffic started to come into play for race leader Sheldon Haudenschild by lap 18, allowing Larson to close a near two second gap. Larson made his winning move on lap 21, driving under the Wooster, Ohio, native near the apron of turn three. Despite heavy pressure by Cole Duncan, Sheldon Haudenschild held on to finish second, followed by Duncan, Tim Shaffer, and Randy Hannagan. Ohio Sprint Speedweek presented by Cometic Gasket will continue with round seven on Friday evening, June 24, at the Limaland Motorsports Park in Lima, Ohio. The high paced quarter-mile will kick off the final weekend of Ohio Sprint Speedweek competition for the Arctic Cat All Star Circuit of Champions, ending officially on Saturday night, June 25, at the Eldora Speedway in Rossburg, Ohio. Limaland did not host an Ohio Sprint Speedweek event during the 2015 season, losing a battle to Mother Nature. Limaland Motorsports Park will open gates at 4:00 pm on Friday night, June 24. The Arctic Cat All Star Circuit of Champions drivers meeting will be conducted at 6, followed by hot laps at 6:30. Those seeking additional news and information should visit Limaland Motorsports Park live on the Web at www.limaland.com.